Southern Utah's Commercial Real Estate Leader! St. George Commercial Real Estate! 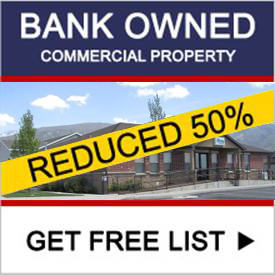 St. George Commercial real estate: Office for lease, Retail for lease, Industrial for lease, Land for lease, Office for sale, Retail for sale, Industrial for sale, Land for sale, and Investment property. 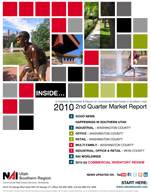 The commercial real estate market reports provide statistics and reports trends for the office, retail, and industrial markets in Washington and Iron Counties. 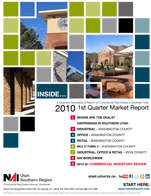 NAI has published commercial real estate market data in Southern Utah since 2001. St. George is southern Utah's largest city. It occupies a stretch of green beneath red rock cliffs in Utah's desert southwest. Its pleasant winter weather attracts a large number of "snowbirds" from northern Utah, who stay for extended periods in the winter while their neighbors back home get soaked. Enjoy more great information about St. George in our St. George commercial real estate blog. At NAI we focus on providing our clientele with personal service, local expertise, combined with the network capabilities of a Global Company. As one of the largest commercial real estate brokerages in Southern Utah we are empowered by sharing, communicating, and collaborating ideas with other experienced agents in our office.